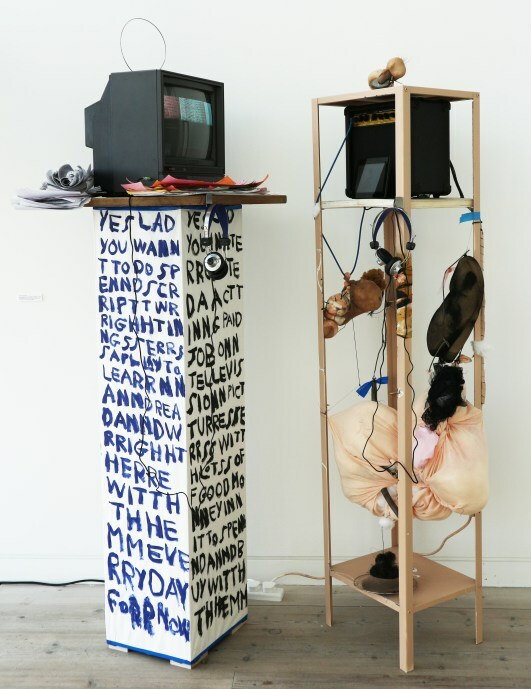 Barry Finan and Rosanne Robertson will exhibit their collaborative installation YES LAD YES LASS in a group exhibition curated by gallery director Zavier Ellis and artist Hugh Mendes. CHARLIE SMITH LONDON is delighted to present ‘Transcript’, a group exhibition curated by gallery director Zavier Ellis and artist Hugh Mendes. Both Ellis and Mendes have an enduring interest in text based work and in the occurrence of text itself in our general cultural environment. 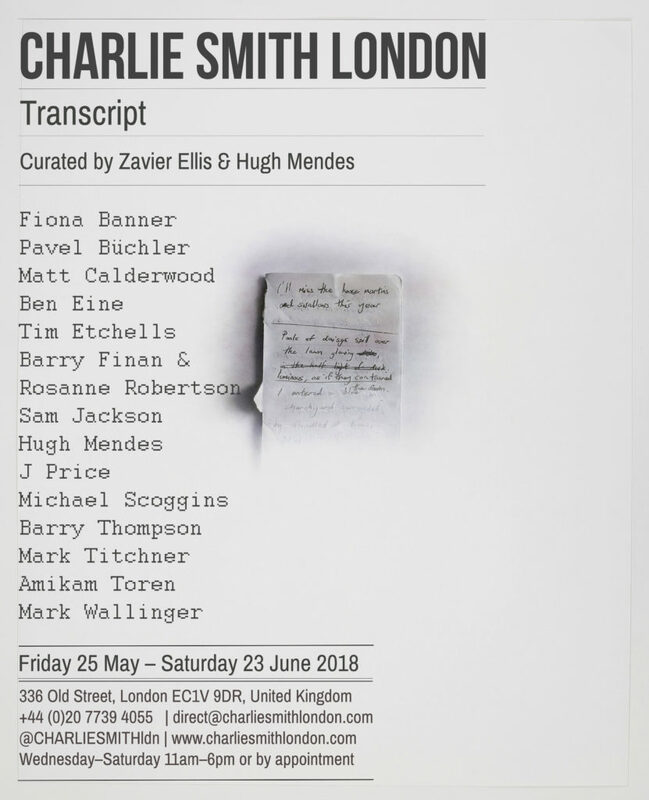 This exhibition will explore the use of text in contemporary art that has been transcribed from every day or alternative sources. For over a century, ushered in by Pablo Picasso’s inclusion of the fragmented word ‘JOU’ and collaged oil cloth in ‘Still-Life with Chair Caning’ (1912), artists have turned to low sources and materials gleaned from everyday life, thereby navigating visual communication away from its traditional reliance on imagery. Found elements derived from life in the studio, street and café were deployed to confront the audience directly with the stuff of reality at a time of great political, social and cultural flux. Fast paced change was axiomatic of the modern period, echoed by incessant industrial, technical and mechanical progress. Additionally, during a period of economic depression during and between the two world wars, adopting the use of accessible collage elements and found objects represented a democratisation of materials in themselves. Read the full Transcript press release – HERE. The exhibition will include a performance by Tim Etchells at the private view and on the final day: Tim Etchells ‘Some Imperatives’, 2011 Performance (performed by Andrew Stevenson) Thursday 24 May at 6.30pm | Saturday 23 June at 3.00pm. Barry sees himself as a writer and an actor, although he has an eye for producing bold striking visual art as part of this. It is important for him to enact the work through readings and broadcasting. Barry works consistently with text. The text is artistically important in that it highlights a vision of life in large letters. Described by Dazed and Confused when selected by Doodlebug as one Manchester’s ‘Emerging Ones’ as working beneath the skin by any means possible. Her drawings and assembled works bind together temporary uneasy relationships- celebrating or showing the fragility of how things are held together in the human mind and by extension the physical world. Either transcending or combusting or both. Working with drawing, performance, sculpture, assemblage and sound she explores tensions, anxieties and relationships between body, object and environment. Human psychology implicated in improvisation and assemblage underpins works anthropomorphic in appearance as an exploration into the unconscious given form.